I visited my best friend in Bristol over the weekend. She's mother to the beautiful Vanessa, who is now 2 months old, and starting to get her own personality. Wonderful! Vintee (my friend) and her husband also live with his sister and nephew, who is almost 4. I haven't asked his mother's permission to mention his name, so I'll just call him N. He's a really bright boy, and so well behaved! N had a couple of his books in his bookbag, which I'll review below. Firstly though, someone I follow on Twitter wrote a blog post looking for book reviewers. If that's you, take a look! He's fun. He's big. He's messy. He's ELEPHANT. And he's never too busy to play. 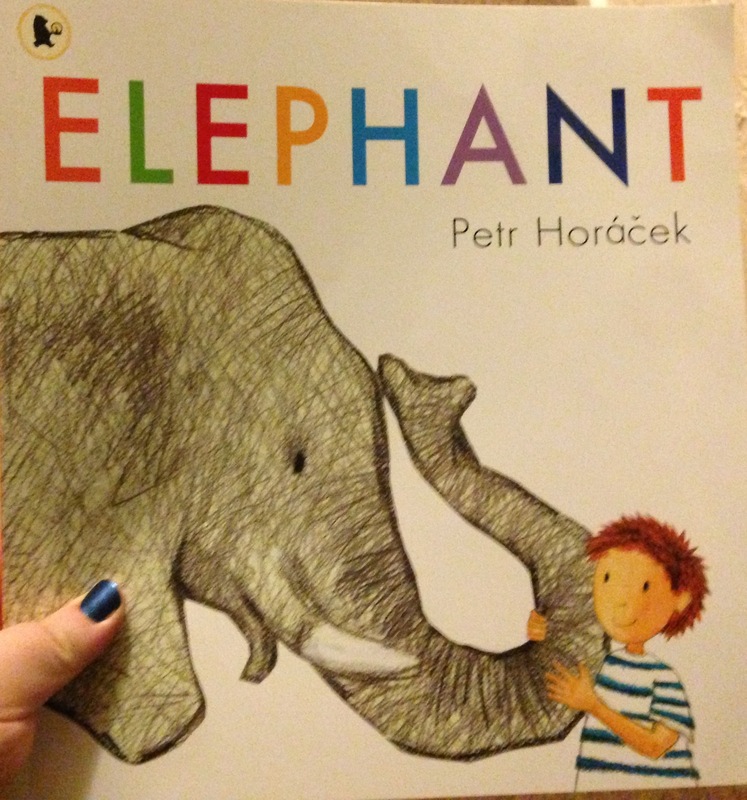 This was a really sweet, beautifully illustrated story that held N's attention. There was enough repetition for him to be able to anticipate what was coming (and so join in more), but then a cute little twist at the end that left him giggling. Recommended! What is the matter with Willaby Wallaby? Why is he sobbing, and throwing a wobbly? Read this bonza billabong rhyme and find out just why one little wallaby is so cross. This book wasn't bad, although I can't say I was the biggest fan. There's a lot of rhyming, which is good, but at the same time, they were very easy to trip over. At one point, the words are arranged on the page to suggest bouncing, which looks good, but wasn't the most practical thing when I was reading it - I kept missing words! N enjoyed it, particularly the repetition of certain phrases (such as "there's an ouch in my pouch", obviously!). However, in parts it did seem as though he was slightly glazing over. Vintee and I got him involved when we could, but whether it was the unfamiliar Australian animals or just that the story was slightly above his level, there only seemed to be a half-hearted enjoyment. Still, it'll probably be just fine when he's just that little bit older! Somebody gave me an award today! I love a good dystopia! Another classic I've only just discovered! I've finally read some Dr Seuss books! Is 'Beautiful Creatures' another Twilight? Kayleigh has read 12 books toward her goal of 80 books.